In Snapshot 130 we saw the very early use of colour (or hand-coloured) photographs to promote motor cars. But the golden age of colour advertising, from the early 1920s right through to the late 50s, was instead the era of the illustrators. They could create beautiful images, far crisper than colour photographs, and unfettered by reality they could let their imagination run riot, with stylish people in beautiful countryside, with multiple views of car, chassis and interior and, in the 1950s, with outrageous distortions of size and width to make the cars look far more enticing. So this colour photograph from 1934 is, we suggest, an early example of their use in car advertising. It’s posed to give the best possible impression of the car and its target customers, but it lets the car speak for itself. Perhaps only a large, luxurious vehicle such as this would have been impressive enough in a real, un-retouched photograph. After early production of small cars from 1901, George Norman Pierce created his 2-cylinder Arrow in 1903. He then decided to move up-market in 1904 with his Great Arrow, a four-cylinder car that would win the Glidden Trophy endurance run in 1905. In 1908, Pierce Motor Company was renamed The Pierce-Arrow Motor Car Company. From 1914 the company adopted its hallmark headlights, mounted in flared housing on the front wings, and these lasted until the company’s demise. The 1934 cars brought a more “youthful” look using rounded body lines. The radiator shell was painted, with only the grill chromed, and the radiator cap was moved under the hood. The V-12 and straight-eight cars for 1934 were joined in April by the car in our picture: the smaller 836A straight-eight, aimed at a larger clientele. Strangely, it didn’t have the famous Archer mascot on the radiator shell. 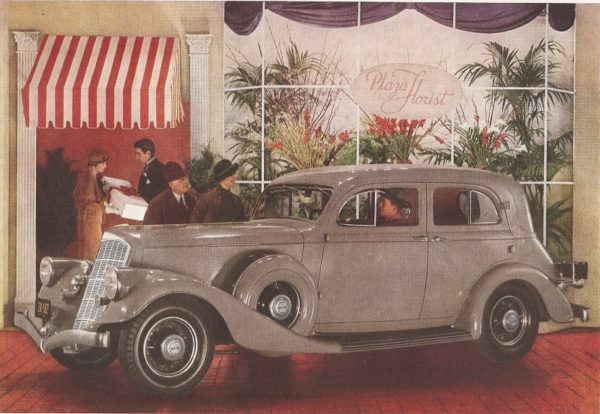 Despite these three new cars, Pierce-Arrow was bankrupt by August, 1934. It tried to merge with Auburn and REO, but failed, and finally closed its doors in 1938.